Sing along, today and every day. Somewhere in the world, there are at least a few people pondering which of the songs Paul McCartney wrote is their absolute favorite. As a tepid Beatles fan (and a mild Wings fan...pun acknowledged but not intended), I'm not really the person to best answer that question. But, hey, this is the Internet, so I'm going to tell you my opinion anyway and you will just have to accept it. But you're not gonna like it. I've got no explanation for that opinion, but I'm sticking by it. If you could've seen the glee that came over me when I heard that song coming from my radio in the kitchen a few weeks ago, well, you would probably be ashamed to know me. But that can't be the first time you've had that feeling, right? A pretty good movie, too, by the way. 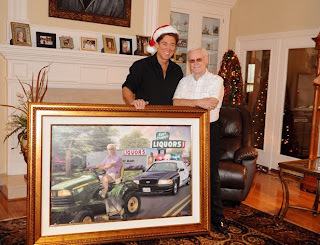 Reason #352,719: Because he now has a portrait recreating his arrest for DUI on a lawnmower. And his wife commissioned it. Read the press release from The Judy Nelon Group (story first found via The 9513. Ronnie McDowell oughta mass-produce those. I'd be in for a print. I'm excited to hear the new discs from Will Kimbrough ("Wings," out Feb. 23) and the Drive By Truckers ("The Big To-Do," out March 16), but after last night's Del McCoury Band/Preservation Hall Jazz Band show, I'm declaring the soon-to-be-released "Preservation: An Album to Benefit Preservation Hall and The Preservation Hall Music Outreach Program" the lead candidate for 2010 Album of the Year. Granted, I haven't heard one full song off the album and, yeah, "special guests" albums have a tendency to be greater in concept than execution, but between reading the stellar list of special guests on the album and seeing the collaboration between the McCourys and the Preservation Hall Jazz band in person, I'm feeling pretty confident in my assessment. Skeptical? Check this preview out. I think an album with Pete Seeger, the Del McCoury Band, Amy LaVere, Jason Isbell, Merle Haggard, Tom Waits, Buddy Miller, Dr. John, and Steve Earle has a pretty good chance of not sucking at all. You can find out for sure on February 16. And here's another tip: when the Del McCoury Band and the Preservation Hall Jazz Band officially start touring later this year, go. Last year, after making several unsuccessful attempts on eBay, I finally achieved a long-time goal (and at a pretty cheap price): owning a poster of "The Fastest Guitar Alive," a Western featuring the one and only silver-screen star turn by the decidedly uncharismatic Roy Orbison. And I'm not knocking Mr. Orbison there; when you have a voice like his, you shouldn't need movie-star charisma. Vox ipsa loquitor, for you Latin aficionados out there (assuming that I have cobbled together the correct Latin phrase for "The voice speaks for itself"). Mr. Orbison's lack of charisma did not prevent the powers that be at MGM from giving him a starring role as Johnny Banner, a Confederate spy with an awesome guitar that features a retractable rifle barrel. I can only guess that the thinking was along the lines of "Well, the kids love the Elvis pictures. Let's make one with that other fella with the high voice. It's a can't-miss."